My Outside Voice: 200th Post. Oh boy, it has been two weeks since my last post. Maybe it was the pressure of my 200th post. Nah. I have just had a lot going on and I have also felt a little uninspired. That will all change with this post. Okay probably not, but it was worth a try. This is a little long, but people it has been two weeks. The boys mom had bypass surgery two weeks ago today. It was sudden, unplanned and scary. We were there with his whole family while they took her in and wheeled her out. It was hard to see her in that condition, but also hard to see his father in that condition. They are SO close and he is very dependent on her. What does that mean. Well he is old school. He doesn't shop, clean or cook. He literally is the bread winner, but at the same time, she also worked full time up until a few years ago. They have an impeccably clean and beautiful home, his mother is a wonderful cook who literally manages their home and their lives. They are also deeply in love (I think this makes for great role models). There were a lot of wet eyes during the past couple of weeks and it really shows you how precious life really is. A lot of the responsibility and care for the boys parents has fallen on us. We are the only ones of his siblings (in the area) that do not have children or pets (read lives) so we have been helping with meals and making sure everyone is comfortable. His brother and sister with their families live in the same suburb as his mom and dad, we are two 'burbs away but we are more "available" not that we would not want to be, it just takes a lot of time. So that is mostly what I have been consumed with. At the same time, the boy made a "list" of 25 items (I mean projects) that NEED to get done at his house. It is hard to maintain homes and we are basically maintaining three and helping with one at the moment. This is tough too, summer is short here in MN so you need to take advantage of things while you can. I am not even going to get into what is on this list, let's just say it is a lot of things that are not THAT MUCH fun. I told him that we still need to make time for the fun stuff too. We are trying on that front. I also have a list, sometimes I can get some of my projects done at his house, sometimes I need to help with his projects. This has made me think a lot lately about why we are maintaining two separate residences due to the fact that we spend every night together and the expense of it. However, we both still like our things and our spaces. We will see, there is definitely more thought that needs to go into it on that front. I just don't think I am there yet, nor do I think he is. We did go to a car show, where he wanted to buy a vintage car. A '66 Chrysler. He was talked out of it when he thought more and more about the maintenance, storage and the new patio and fireplace he wants for his own home. His brother was there showing his car with his girlfriend and her boys. We also went to Grand Ol' Days with his brother and his girlfriend, I ran into a few friends there, we saw some good bands and ate food that was not very good for us, but we had a good time. We also have been spending some time with my sister and her family. We babysat the kids one night, had a BBQ with them and I went to my nieces soccer game. The best part is, I am really seeing the kids start to form a true bond with the boy. My nephew Grant, who is my bubee, and we have a very close and special bond, could not even look at the boy until late January. When we babysat the other night, he climbed up onto his lap and cuddled in so they could play gameboy, it gave me goosebumps! Neither of us want or plan to have kids, but I do love my niece and nephews more than anything and it is very important to me that we have a good relationship with them! Work is completely uninspiring, I am looking to change that and hopefully will have things to report soon, but we will see. We are trying to have nice dinners, with his family and my family as well as take time for one another. He had drills this past weekend and we made it through that. Thank goodness. Our relationship has been challenged in the past couple of weeks by his relationships with his friends who make bad choices. I have to remember that these are his friends making choices for themselves and not for us and we choose whether or not we let them affect us, but again, I also do not need these people to be a part of my life but have to have respect for the fact that these are his friends and he chooses how they are a part of his life (seriously though, who gets married to someone after only knowing them for two months, did I also mention that this is his second marriage and fifth engagement--also, who starts dating their best friends ex-girlfriend only a couple of days after they end a three year relationship, did I also mention that there is a 15 year age difference and this is not the first time he has done this? Enough about this though, I am not going to let it affect me). We are going to the lake this weekend. By ourselves, this will be the first weekend we have been up there this year by ourselves. I had thought about asking a couple of people to come up with us, but I am thinking a weekend alone doing nothing will be nice, for both of us. We are going to grill, fish, lay on the lake, read and do a little upkeep but nothing major. I am looking forward to it. I have a wine tasting for my wine club tonight. This one is only for the girls, completely unfair I know, BUT, I have had the best response so far, more so than any other event and I have approximately 75 girls coming tonight, so what does that say? I am really looking forward to this event, and while I am nervous because it is going to be such a large event, I am also looking forward to it. I have been doing this club on my own for 10 months now. I have had 13 events with 3 more planned for June and July and we now have 218 members. Whew, what a 10 months it has been. Like I said, I wish I had more help, because it does take on a life of its own and can literally almost be a full time job, but the boy is wonderful and a HUGE help. He helps remember names at events, socializes, makes introductions and makes everyone who is new feel welcome and comfortable. In that sense he is such a wonderful source of strength and support. Tonight though, it is a girl thing, but what has he done to help me? He picked up wine and the wine glasses from my house (I have not really been at my house in two weeks). He is going to bring me to the event and then pick me up so that I do not have to worry about driving and he is going to help me set up. WOW, that is one great guy when he would rather be at the gym or crossing things off of his list. 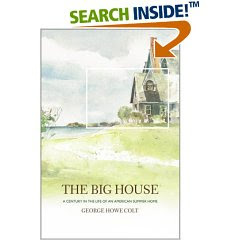 I have been reading "The Big House" courtesy of Workin' That Preppy and I have REALLY been enjoying it. Besides the fact that I am a history buff and love history and tie-ins, I love the Cape and have just been loving the scenery of this book. I am really going to be sad when it ends, but I am so glad that she has started this blogland book club. It has been very very hot here the past week. For that I am glad we have been at the boys, he has central air and it makes sleeping so much easier. We have been working on projects and getting things crossed off which is nice. We also have been trying to take time for one another too, like I said earlier, our relationship has been challenged in the past couple of weeks just with the stress of everything going on, but I also think that it has made us closer and stronger and showed that at least our communication skills are strong and intact. We have been trying to go for a good long walk at night, last night we did not even leave for our walk until almost 9:00 pm, but we wound up at the convenience store and had a little ice cream treat which was nice. If I had to be honest, I am ready for life to settle down a little and go back to normal, although I am not sure what normal is anymore and is that even a good thing. I guess things like these past couple of weeks shake things up a little bit and just make you really appreciate life and all it has to offer. Sorry I have been so MIA, I am going to try to get back into my routine again, I think it will help me keep my sanity too! Cheers to all of you, I hope that by now you are all enjoying summer and all it has to offer! The peonies have pretty much come and gone here, but the photo on top is from the boys neighbors yard. She is very very nice and has a doggie that I think I am in love with, but that is for another post! Oh Jilly, I am so sorry to hear about your guy's mom. That is so scary. She is very lucky to have you and you are such a good person for being there for the family. I hope you have a great weekend and that you and the boy enjoy your alone time...you certainly deserve it! Wow, what a doozy for your 200th post! As J. said, you are such a wonderful spirit for stepping up to the plate and helping when help is needed. I too wish you a really lovely weekend up at the lake. Put your feet up, have a glass of vino, and relax, you've earned it! ps: I don't want to get all excited too early, but is it okay to be a little excited that you and Boy are starting to think about moving in together? Oh boy, what a time you've had. Enjoy the lake curling up with the book and the boy. glad you're back, hope things improve with your boy's mom. Peonies are beautiful, congrats on the 200 post and I love love the big The Big House, I've read it 3 or 4 times now. I'd love to hear your thoughts on it. wow! you are so busy! i'll be thinking of the boy's mom - that's scary stuff! good luck with the to-do list and keep getting that good time in with the boy for walks - that time is so important! Have a great weekend - sounds like it's just what you need! Welcome back, you have been busy! Enjoy your quiet weekend by the lake and relax! Glad you're back! Sorry to hear about the Boy's Mom. I'm sure he appreciates everything you've been doing for her and his family. Have a wonderful weekend at the lake!